You might remember this formula from high school or college. For some of us, it still pops up in the middle of the night smack in the middle of that dream, the one where you're in a final exam for the class you never attended. 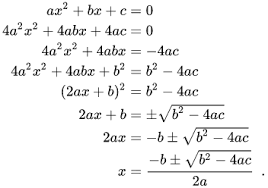 That's the Quadratic Equation in a nutshell. Why are we writing about the quadratic equation? Simple, if you have a pension plan - a good old fashion regular pension plan from a former employer, the odds are high you're going to get an offer from that company which will require old math skills long dormant. With almost no warning, and even less fanfare, the Treasury Department issued a notice in March that will allow employers to 'buy out' their retirees' pensions. This revives a practice the Obama administration ended in 2015 banning the practice. Buy-outs of defined benefit pensions was banned by the Obama Treasury Department even though opting to take a lump sum instead of a monthly payment is entirely voluntary. At least in theory. Unfortunately, when first offered, they look . . . well, cool. Enticing. Maybe even life changing. For someone about to retire, or even retired for years, the sudden offer of, say, $400,000, in one shot can be overwhelming. That's the problem, of course, it looks great and study after study have shown that people tend to value "money that's right in front of them over money they will get in the future." Aside that, there's almost always an immediate need - house or car repairs - and/or pressure from family members to help out. And why not, it's so much money. The Treasury Department stopped the practice after years of complaints and a sharp uptick in retiree's running out of money long before death. A MetLife study found that one in five retirees who took the lump sum had spent it down to zero withing five and one half years of receiving it. This shouldn't be a matter of who wins in the long run, it should be about what's fair and taking care of elders. But, of course, that's not the case. The short answer here is: pretty much everyone except the retiree and their family. Companies win because pension plans are corporate liabilities. Big liabilities, the kind that are noticed by Wall Street rating agencies. Pensions are also expensive to manage. Getting rid of those pensions is extraordinarily beneficial to the corporate bottom line. Financial services firms are looking at a sharp influx of money to manage. That, of course, means commissions, fees, more money under management and all the perks that may entail. None of that would matter all that much except for the fact that - again, in study after study - it turns out retirees who take the lump sum are usually doing so at a significant discount from what the pension is actually worth. In most cases, the retiree is getting 20-30% less than what the pension could have bought over time. If you're retired on a defined benefit pension you almost certainly will be contacted soon about 'your lump sum option.' The offer will look great. The offer will be enticing, especially if the house needs new gutters; or you can finally, ala Clark Griswold, put in a pool for the whole family; or a grandchild is headed for college and can use some help. The math . . . well, the math is not straight forward. It is, in fact, immensely complicated. Because it not just about the six figures, it's about deriving income from it while not fatally pulling down the principal; the tax implications; and much, much more. But, how do you turn down a check for, say, $500,000? By realizing you're actually giving up a lot more. Which is exactly hat you are most assuredly doing. If you get one of these offers, please call us before you do a thing. Please. Too much can go wrong not to. Thank you very much for the information on the pension buy outs . I am a former teacher living on a pension .